Antikapratika will be exhibiting, during the two days dedicated to Designer Street Market and creative excellence chosen by VANS in the fervid artistic and artisanal panorama of Berlin. Antikapratika responded to the invitation with the creation of an exclusive limited edition product that will be displayed in 4 examples. A Vans shoe model Sk8-Hi in scale 1:1 made of ceramic and hand painted with the unique style of Antikapratika. One of the four tattooed porcelain limted edition models, presented at House of Vans Berlin. At the Antikapratika Stand, you will find limited edition of handcrafted Vans Shoe pins, decorated in gold and, in addition to the limited edition products designed for the occasion, the Full Collection of their unique Tattooed Ceramics, the "Black Lines" and the "Blue hand_painted". The Street market and all other House of Vans events will take place at Ewerk in Wilhelmstraße 43, 10117 Berlin, a cult location in the city, an area with a typical "industrial" atmosphere that hosts important events in the Berlin cultural scene. The opening time will be 13:00 to 18:00 for both days: Saturday 30th and Sunday 31st, 2019. The Ewerk features two large event halls in industrial design, a large modern roof terrace, the historic electrical substation with multiple conference rooms, outdoor areas, and backstage spaces, as well as expansive delivery zones and parking spaces. Whether your event is a conference, gala dinner or get-together, a smaller event for 20 people or a large-scale event with up to 2,000 guests, the Ewerk has the ideal space for you. Come experience the unique ambience of the oldest surviving example of architecture from the field of commercial electricity production in Germany! Vans will revolutionize the building into a cultural hub celebrating art, music, action sports and street culture bringing Vans' "Off The Wall" spirit to life. With an array of curated programming free to the community, this unique pop-up experience will be one of the biggest House of Vans experiences to date. Vans®, a VF Corporation (NYSE: VFC) brand, is the original action sports footwear, apparel and accessories brand. Vans® authentic collections are sold in 84 countries through a network of subsidiaries, distributors and international offices. Vans® has over 2,000 retail locations globally including owned, concession and partnership doors. The Vans® brand promotes creative self-expression in youth culture across action sports, art, music and street culture and delivers progressive platforms such as the Vans Park Series, Vans Triple Crown of Surfing®, Vans Pool Party, Vans Custom Culture, and Vans' cultural hub and international music venue, House of Vans. We’re starting the year with a NEW COLLECTION of hand painted Porcelain. 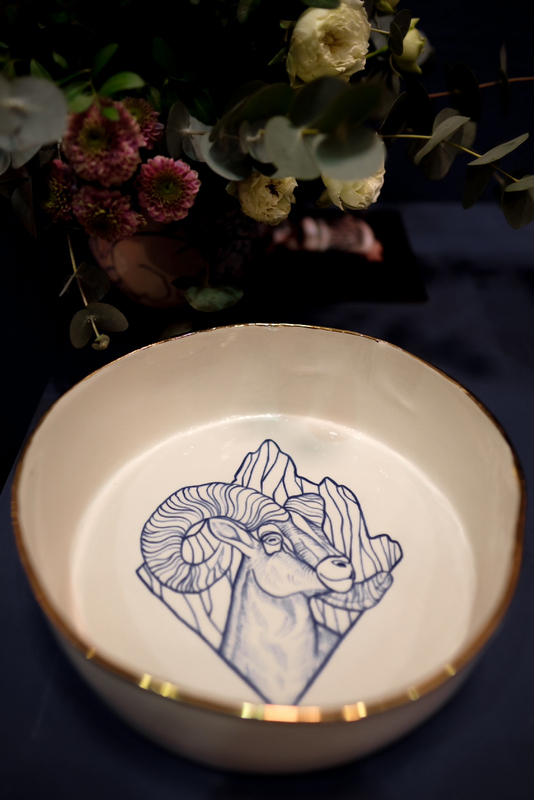 Unique, exclusive single pieces of handcrafted porcelain, hand painted with modern cobalt blue, underglaze tattoo motifs. We’re presenting the full Collection at January Fair NORDSTIL in HAMBURG . Where to find our Ceramics? you will be redirected to our #Etsy store, there you will have a full selection of our ready to Ship Ceramics. We offer FREE SHIPPING all over Germany and SPECIAL RATES all over Europe. Send us an E.mail or call us to get an appointment. We will be happy to welcome you at our Lab, is a small lovelly “werkstatt” in the heart of Prenzlauer Berg - Berlin. Drop at Blut & Eisen Tattoo Shop and feel the tattoo vibes. There´s an accurate selection of Tattoed Ceramics, well displaied in the window of this amazing Tattoo Shop. While you´re choosing your next Morning Cup, you might get tempted to ink your skin by amazing talented Artists at Blut & Eisen. 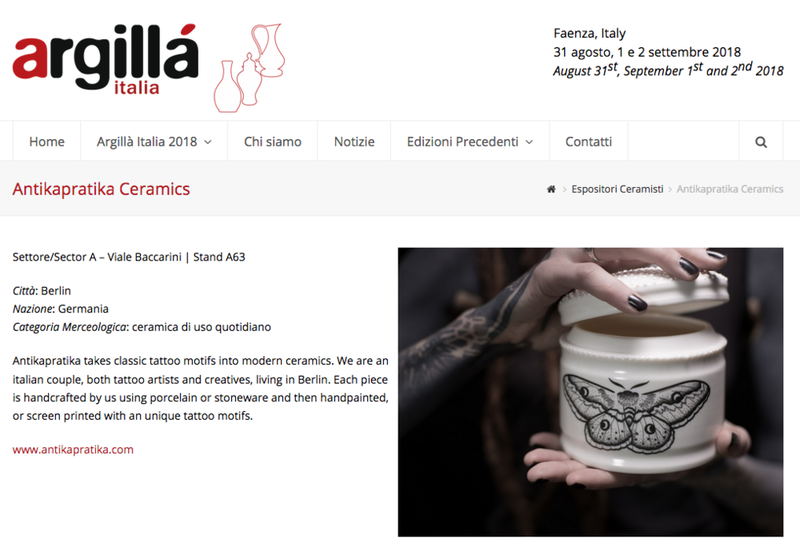 If you would like to get a Custom Tattooed Ceramics, with a personalized motifs or a special writings, write us. We wish you great time! 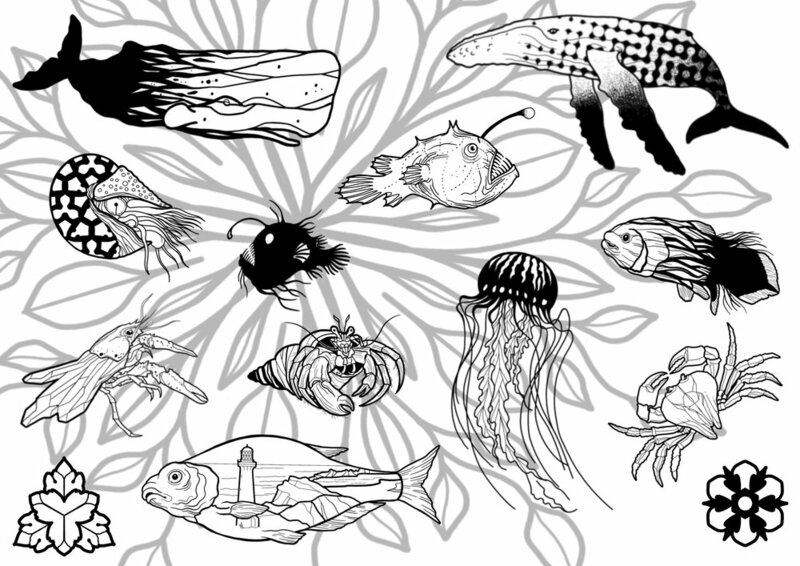 Ivan will take part at "Ink'n Ocean Days Berlin" , an event created by Sea Shepherd Deutschland. Drop by at BLUT & EISEN, choose the tattoo you like from different Set flashes, prepared just fro this event by the Artists and get INKED. The Money raised during the event will support Sea Shepherd Deutschland. Many of you might know, as we needed a bigger working space, we are now producing our ceramics in a new location in Berlin. Twice a year, the Atelier open the doors for a Collective Exibition of Berlin based Artists. Rykerstraße, 43 - Prenzlauer Berg, Berlin. We´re having a short winter holiday till 18th January 2018. If you would like to get in touch with us during this period, write an E.mail, we will do our best to get back to you as soon as possible. Please notice that during this time, our online Shop will be open, but orders done in between, will be shipped starting January 18th. We wish you happy holidays and all the best!! We´re on the "Badische Zeitung"
Gift, Gift, Gift.. 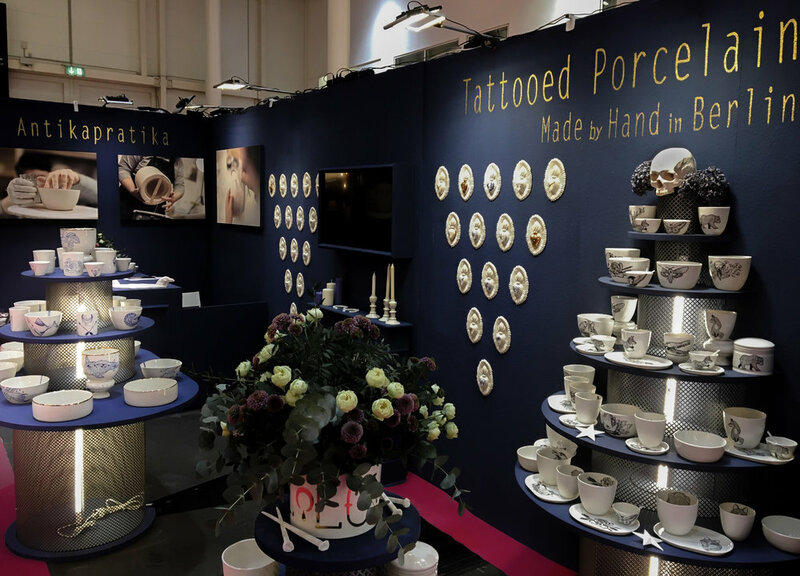 The tattooed ceramics Collection is in the " Wunschzettelempfehlungen 2017: Weihnachtsgeschenke aus dem Netz" .. Recommended Christmas Wish List for 2017 . Subcultours connect you to the City creative crowd.. and now you can know more about Antikapratika, our life story, our work and share time together with us and Kornelio. December with us ! Christmas Markets in Berlin .. Looking for a special Gift? Check this out! We're extremely honored to announce our collaboration with Kühn Keramik – Berlin. This special collection will be presented at Maison & Objet Paris in September 2016.